Right, let me be frank, these sound pretty posh, but they’re in fact nothing else than deep-fried Mars bars! I swore never to eat such a culinary perversion, yet on one night out in Glasgow, I was converted! At a local chippie, I tried a proper deep-fried Mars bar and realized that it’s in fact a pretty acceptable dessert. It slightly reminded me of churros: crunchy and fatty on the outside, with a melting chocolate centre. Still, I couldn’t stomach a whole one. So, instead I’ve used mini chocolate bars to make my beignets and enhanced the beer batter with vanilla sugar and a pinch of cinnamon. 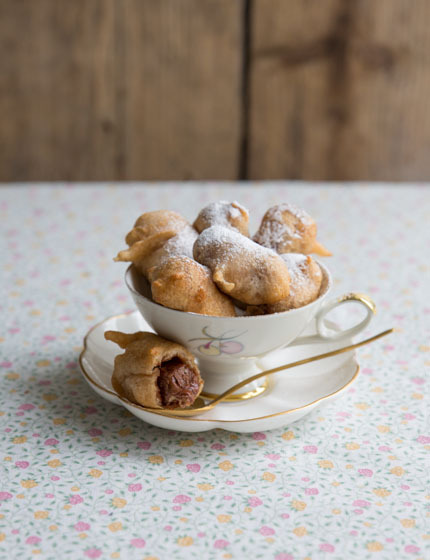 I know it’s still slightly nuts, but, believe me, these mini chocolate beignets are a real party pleaser. I made these decadent treats in the Party epsiode of my show.